Labour economics as a discipline has changed dramatically in recent years. Gone are the days of a "job for life". These days, firms and employees are part of a less regulated, more fluid, and more international labour market. Knowledge, training, human resource development and human capital are all major factors on the contemporary scene. conflict at work, including both strikes and, uniquely, individual disputes. Other issues explored include the supply and demand of labour, wages, the current role of trade unions, bargaining and conflict, and working time. The book is written in a clear, accessible way with some mathematical exposition, reflecting the text’s grounding in current microeconomic theory. The book also contains case studies designed to illuminate theoretical concepts and exercises and discussion questions to test the students understanding of the various concepts outlined in the text. Peter Sloane is Emeritus Professor of Economics at Swansea University, UK, where he was the Director of the Welsh Economy Labour Market Evaluation and Research Centre. He is also Adjunct Professor at the National Institute of Labour Studies, Flinders University, Australia. Inter alia he is author of Labour Economics, Employment Equity and Affirmative Action: An International Comparison and The Economics of Sport. Paul L. Latreille is Professor of Management at the University of Sheffield, UK. He is an expert on workplace conflict and its resolution, including Employment Tribunals and mediation, vocational training, disability and inactivity. Nigel O’Leary is a Reader at Swansea University and an Associate Professor at the National Institute of Labour Studies, Flinders University, Australia. He has published extensively in international journals in the areas of the economics of discrimination, educational economics, trade unions and labour market attachment. "This new book covers a comprehensive, in depth and example rich analysis of the theoretical and empirical foundations of Labour Economics. It strikes a very good balance between 'classical' models and new research frontiers of the subject matter. Scholars and students interested in the changing shape of labour markets, especially in the UK context, will find this extremely valuable." "This book offers a fresh, in-depth and extremely well-resourced coverage of labour economics concepts, with numerous applications relevant to the undergraduate and postgraduate student, as well as to researchers in the field. The comprehensive treatment of the relevant theory is supported by numerical analysis (algebra) inserts, while case studies are presented alongside an eclectic mix of relevant empirical articles. It is, thus, a must-have and must-read book for labour economists, in view of the high level of useful information presented within a modern and inspiring structure that delivers both quantitative and qualitative detail, as well as an interesting and useful balance between theory and its wide applications." "A truly comprehensive and contemporary textbook on Labour Economics incorporating theory as well as relevant and interesting examples and case studies. Its particular strength is that it incorporates several models, based on a rich survey of research literature, to explain a concept. This will enable students to get a clear understanding about the complexity of the functioning of labour markets and related issues." 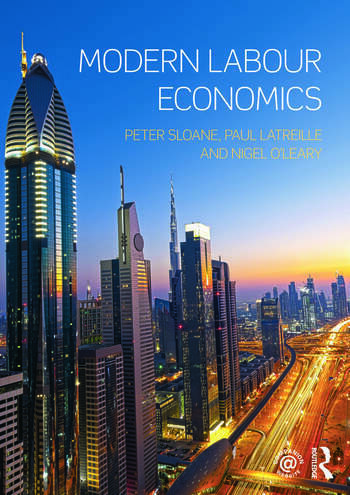 "Sloane, Latreille and O'Leary have produced an excellent book which takes readers to the frontier of contemporary labour economics research. The book blends the latest theoretical developments, including search theory and asymmetric information, with up-to-date empirical facts and current policy debates. I highly recommend Modern Labour Economics to advanced undergraduate and post-graduate students, and to all researchers grappling with contemporary labour market issues."